HÀ NỘI – A pair of maps indicating areas at risk of flooding along 28 coastal provinces and cities in Việt Nam has been officially put into use. 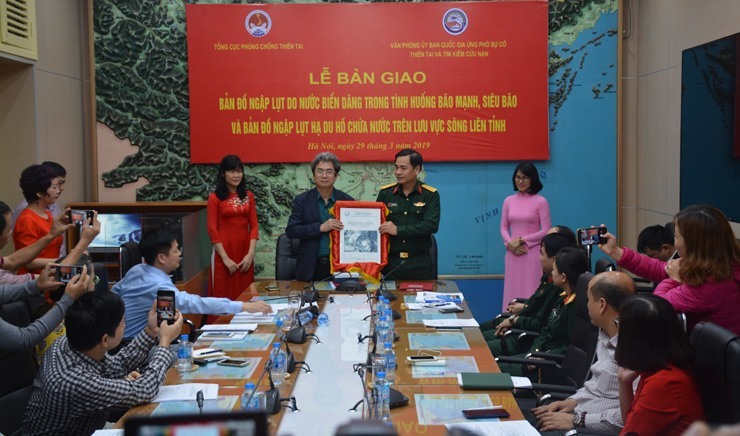 The Vietnam Disaster Management Authority (VDMA) under the Ministry of Agriculture and Rural Development, in co-ordination with the Office of the National Committee for Disaster Response, Search and Rescue, handed over copies of the two maps to relevant agencies on Friday. At the handover ceremony in Hà Nội, Vũ Xuân Thành, Deputy General Director of VDMA, said the first map was designed to cover five scenarios corresponding to the strength of storms hitting the country’s coastal areas. The other map corresponded to reservoirs along inter-provincial river basins in the case of high discharges and dam failures of six rivers – Hồng (Red), Mã, Thu Bồn-Vu Gia, Ba, Srepok and Sê San. Thành said the maps would help the central disaster prevention committee, city and province-level climate offices and central relevant agencies plan for climate change. After receiving the maps, Colonel Nguyễn Hữu Hùng, Deputy Director of the National Committee for Disaster Response, Search and Rescue, also Deputy Director of the Ministry of Defense’s Rescue Department, said they would help the unit co-ordinate and carry out of search and rescue operations. At the event, experts from agencies, including the Việt Nam Institute of Water Resources Research, Institute of Hydrometeorology and Climate Change and the University of Water Resources presented their work in researching, drafting and building the maps. Facing the increased threat of natural disasters, the Prime Minister assigned the Central Steering Committee for Natural Disaster Prevention and Control to develop flood maps. The maps will help the steering committees for natural disaster prevention and local authorities prepare for natural disasters. The 24th conference of parties to the United Nations Framework Convention on Climate Change (COP 24) listed 10 countries most severely affected by climate change, of which Việt Nam ranked 6th. Natural disasters are a big threat to the nation’s sustainable development. Over the past 20 years, the country has suffered most types of natural disasters (except tsunamis), causing heavy losses to human life, property, infrastructure and production. On average, about 400 people die or go missing each year due to natural disasters. Economic losses due to natural disasters impact about 1-1.5 per cent of GDP per year, of which the most serious damage is from strong storms and flooding. The Ministry of Natural Resources and Environment says coastal provinces are particularly at risk of strong storms and super typhoons. River basins are at high risk of flooding. In Hà Nội, a workshop co-organised by the Asian Disaster Prevention Center (ADPC) and the VDMA discussed resilience for urban areas towards disasters and extreme climate issues in Southeast Asia. Đòan Thị Tuyết Nga, director of the Department of Science, Technology and International Cooperation under the VDMA, said the goal of the workshop was to help participants understand the needs and issues of disaster prevention in Southeast Asia’s urban areas to propose plans in Việt Nam. At the workshop, participants discussed issues related to resilience for urban areas against extreme climate issues and proposed solutions to be implemented in Việt Nam. The workshop will enhance the ability to share information and coordinate with coastal provinces, including two cities of Nam Định and Mỹ Tho City - where ADPC chose to implement this programme.